Special dressing’s today: Dire Straits ==> Twisting by the Pool… Eating by the pool, Having fun by the pool, Resting by the pool, Drinking gin tonic in the evening by the Pool… Get the idea???? Haaaaahhhha… Isn’t it great to be on holidays? As you may have noticed already, Duck is one of my favourite meats, so tasty and flavourful. Without really knowing, my diet is following the advise of nutritionists and dietists. The duck stores its fat in the skin so if you discard it when cooking it, the cholesterol rate will be very low. However, in this case I roasted it with the skin to give more flavour to the dish, once cooked, I discarded the skin and ate the meat. This same dish could be done with rice if you prefer, you just need to adjust the water or stock measurements and the cooking time. Ingredients for 3 servings (notice that this time is for 3 instead of 4): 500 grs. 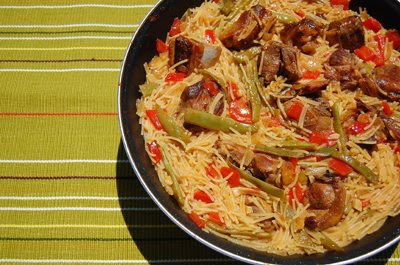 of duck cut in small pieces, 1 medium onion, half red pepper, 10 to 12 green beans, 2 garlic cloves, 3 tablespoons of canned fried tomatoe sauce, 200 grs of noodles (nº 2), 3 glasses of chicken stock or duck stock or water, olive oil, salt and black ground pepper. All ingredients are fresh, this time I only used the tomatoes sauce canned. Pour some olive oil to the paella (it means pan in Spanish) and when hot (not when burning) add the salted duck pieces. Roast for a while, stirring now and then and when golden reserve. Meanwhile get the stock or water simmering in a pot at low heat so that you have it ready when you need it. Low down the heat to medium/low, and add the minced onion, when transparent add the green beans cut in pieces and the red pepper in small dices, also mince the garlics and add to the paella. Stir for 3 to 4 minutes and add the fried tomatoe sauce. Stir and add the duck back to the paella. After 1 or two minutes, add the noodles and turn the heat high. Stir and immediately after pour the boiling stock in the paella. Let the rest of the stock keep on boiling at low heat just in case you need more after. Taste and add salt and pepper to your convenience. Follow pasta package instructions (my noodles needed 6 minutes to get cooked).First 3 minutes have the heat at maximum temperature, the other 3 at medium low. Finally turn heat off and leave the paella covered for one minute. Set your table and… Tachan ♫ The dish is ready!!! I admit it…I’m jealous…paella (one of my favorite dishes of all time) AND vacationing by the beach and pool. Lucky you and lucky us that your sharing it all. Thanks for playing Presto Pasta Nights. Love your entries. I hope you had a marvelous time by the beach and the pool (how could you not?)! Wow Ruth! 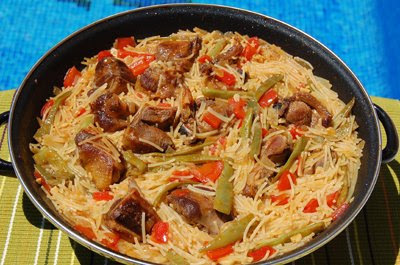 With your kind words… I don’t need to eat… feel so flattered :D.
Paella with noodles! What a great twist on a classic! When I make fiduea I LOVEEEEEE putting it in the oven under the broiler for a few minutes so that the bits of noodles on the top get all crunchy and crusty. LOVE LOVE LOVE LOVE the idea of doing it with duck!!! He, he and on top is sooooo easy Ann!!! Hey Amy! Yeah the broiler makes them look like a punks’ hair head ;-). Didn’t do it this time but I also Love it!!! Nuria, I am glad you had a nice time. Thanks for explaining what paella means. I thought that paella was the name of the dish. It’s like in Greek saganaki and giouvetsi are the names of the utensils in which they are cooked. It looks delicious. Good food, sun, pool. Youhaveit all. Duck is one of my favorites. I like the spanish twist. Welcome back Nuria and I hope you recharged your batteries. I love how you use Fidea noodles from dry to cooked from the liquid in the dish. 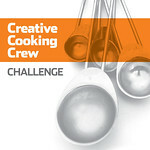 I must try this method out…you’re always full of cooking tricks! 06/26/2008 · 3:44 h by K.C. Hola Ivy :D. Yes, there’s a big confusion with the paella word, but that’s why I’m here for ;-). What it started being the name of the pan it ended up being the name of the dish… but we still use the pan (paella) to do other dishes! Hola Kayce! 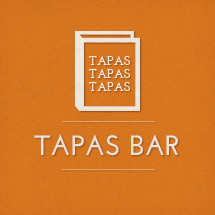 Welcome to Spanish Recipes!! Thanks so much for your kind words. Isn’t life about these little pleasures? He, he! YOu are so nice Dharn! 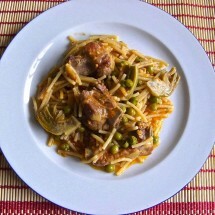 Just plan your holidays here in Spain, Barcelona and I’ll cook for you and your darling family!!! Oh oh…I got sunburnt just thinking about the time you spent by the pool. This dish looks fabulous. I’ll be close to Spain…unfortunately, not close enougnh. I am super impressed by this dish, so creative and delicious looking! Thank you for entering it into this week’s Presto Pasta Night roundup! Can’t wait to post tomorrow. Hey Hillary! 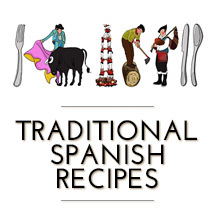 Welcome to Spanish Recipes! No problem ;-) It’s a pleasure to participate in the event!!! I should do it often. So glad you like the dish! Ai, I jumped over Psychgrad and Val’s comments… sorry! Psychgrad, I didn’t get a sunburn, I’m quite a professional here, he, he! We sunbathed always after 5:30 pm! Hola sweet Val :D I think you need an urgent vacation: pack your things and come over… bring your dauther too!!! Nuria this looks sooooo yummy! I absolutely love that you eat duck so much and I admit I am jealous! I order it out a lot but I don’t really cook with it because my butcher only sells whole ducks, and that is a lot for two people to eat!